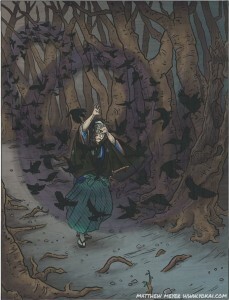 APPEARANCE: The yosuzume is a rare bird yokai found on Shikoku and in neighboring prefectures. As their name suggests, they are nocturnal, appearing on remote mountain passes and forested roads late at night. Like ordinary sparrows, they are usually found in large flocks, and are very noisy. In some places, yosuzume are known as tamoto suzume, or “sleeve sparrows,” and their appearance was a sign that wolves, wild dogs, or other yokai were nearby. Their call is mysteriously only ever heard by a single individual, even when traveling in groups. It was considered very bad luck if a tamoto suzume should jump into one’s sleeve while walking, and so travelers would hold their sleeves tightly shut when traveling in areas inhabited by these birds. In other areas, yosuzume are not seen as bad omens, but as warning signs that a more dangerous yokai, the okuri inu, is nearby. For this reason, the yosuzume is also known as the okuri suzume, or “sending sparrow,” and its call is said to be a reminder to travelers to watch their footing on the dangerous mountain paths and to not fall down.